These Brioches à Tête are Paul's interpretation of the showstopper challenge in the Sweet Dough episode of Season 2 of The Great British Baking Show. It is explained in further detail by Paul in Season 2 Masterclass: Part 3. Put the flour, sugar, yeast, salt, milk and five eggs into a free-standing food mixer and mix, for about five minutes, to a smooth dough. If mixing by hand, this will take about eight minutes. Add the butter to the dough and mix for a further five minutes in the mixer, or 10 minutes by hand. Put the dough into a bowl, cover and leave in the fridge overnight. The dough should now be stiff and easily shaped. Cut the dough into 50g (1¾oz) pieces and divide 45g (1½oz) for the brioche bodies and 5g (¼oz) for the brioche heads. Using your hands, shape the dough pieces into balls. Put each large piece of dough into a brioche mold and push a smaller dough on top of each once. Leave the brioche in a warm place to rise for one hour. Preheat the oven to 400F. 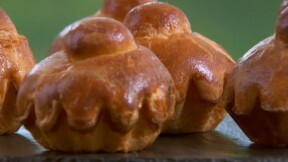 Brush the brioche with the egg wash and bake for 20 minutes, or until golden-brown.